This article is about the early type of image projector. For other uses, see Magic lantern (disambiguation). The magic lantern, also known by its Latin name lanterna magica, is an early type of image projector employing pictures painted, printed or produced photographically on transparent plates (usually made of glass), one or more lenses, and a light source. It was mostly developed in the 17th century and commonly used for entertainment purposes. It was increasingly applied to educational purposes during the 19th century. Since the late 19th century smaller versions were also mass-produced as a toy for children. The magic lantern was in wide use from the 18th century until the mid-20th century, when it was superseded by a compact version that could hold many 35 mm photographic slides: the slide projector. 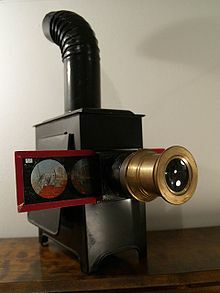 The magic lantern used a concave mirror in back of a light source to direct as much of the light as possible through a small rectangular sheet of glass—a "lantern slide"—on which was the image to be projected, and onward into a lens at the front of the apparatus. The lens was adjusted to optimally focus the plane of the slide at the distance of the projection screen, which could be simply a white wall, and it therefore formed an enlarged image of the slide on the screen. Some lanterns, including those of Christiaan Huygens and Jan van Musschenbroek, used 3 lenses. Originally the pictures were hand painted on glass slides. Initially figures were rendered with black paint but soon transparent colors were also used. Sometimes the painting was done on oiled paper. Usually black paint was used as a background to block superfluous light, so the figures could be projected without distracting borders or frames. Many slides were finished with a layer of transparent lacquer, but in a later period cover glasses were also used to protect the painted layer. Most hand-made slides were mounted in wood frames with a round or square opening for the picture. A paper rimmed mass-produced slide. After 1820 the manufacturing of hand colored printed slides started, often making use of decalcomania transfers. Many manufactured slides were produced on strips of glass with several pictures on them and rimmed with a strip of glued paper. The first photographic lantern slides, called "Hyalotypes", were invented by the German-born brothers Ernst Wilhelm (William) and Friedrich (Frederick) Langenheim in 1848 in Philadelphia and patented in 1850. Apart from sunlight, the only light sources available at the time of invention in the 17th century were candles and oil lamps, which were very inefficient and produced very dim projected images. The invention of the Argand lamp in the 1790s helped to make the images brighter. The invention of limelight in the 1820s made them very much brighter. The invention of the intensely bright electric arc lamp in the 1860s eliminated the need for combustible gases or hazardous chemicals, and eventually the incandescent electric lamp further improved safety and convenience, although not brightness. Several types of projection systems existed before the invention of the magic lantern. Giovanni Fontana, Leonardo Da Vinci and Cornelis Drebbel did even describe and/or draw image projectors that may have been quite similar to the magic lantern. In the 17th century there was an immense interest in optics. The telescope and microscope were invented (in 1608 and the 1620s respectively) and apart from being useful to some scientists, such instruments were especially popular as entertaining curiosities with people who could afford them. The magic lantern would prove to be a perfect successor. The magic lantern can be seen as a further development of camera obscura. This is a natural phenomenon that occurs when an image of a scene at the other side of a screen (or for instance a wall) is projected through a small hole in that screen as an inverted image (left to right and upside down) on a surface opposite to the opening. It was known at least since the 5th century BCE and experimented with in darkened rooms at least since circa 1000 CE. The use of a lens in the hole has been traced back to circa 1550. The portable camera obscura box with a lens was developed in the 17th century. Dutch inventor Cornelis Drebbel is thought to have sold one to Dutch poet, composer and diplomat Constantijn Huygens in 1622, while the oldest known clear description of a box-type camera is in German Jesuit scientist Gaspar Schott's 1657 book Magia universalis naturæ et artis. The 1645 first edition of German Jesuit scholar Athanasius Kircher's book Ars Magna Lucis et Umbrae included a description of his invention, the "Steganographic Mirror": a primitive projection system with a focusing lens and text or pictures painted on a concave mirror reflecting sunlight, mostly intended for long distance communication. He saw limitations in the increase of size and diminished clarity over a long distance and expressed his hope that someone would find a method to improve on this. In 1654 Belgian Jesuit mathematician André Tacquet used Kircher's technique to show the journey from China to Belgium of Italian Jesuit missionary Martino Martini. It is sometimes reported that Martini lectured throughout Europe with a magic lantern which he might have imported from China, but there's no evidence that anything other than Kircher's technique was used. However, Tacquet was a correspondent and friend of Christiaan Huygens and may thus have been a very early adapter of the magic lantern technique that Huygens developed around this period. Prominent Dutch scientist Christiaan Huygens, is nowadays widely accepted as the true inventor of the magic lantern. He knew Athanasius Kircher's 1645 edition of Ars Magna Lucis et Umbrae which described a primitive projection system with a focusing lens and text or pictures painted on a concave mirror reflecting sunlight. Christiaan's father Constantijn had been acquainted with Cornelis Drebbel who used some unidentified optical techniques to transform himself and summon wonderful appearances in magical performances. Constantijn Huygens wrote very enthusiastically about a camera obscura device that he got from Drebbel in 1622. The oldest known document concerning the magic lantern is a page on which Christiaan Huygens made ten small sketches of a skeleton taking off its skull, above which he wrote "for representations by means of convex glasses with the lamp" (translated from French). As this page was found between documents dated in 1659, it is believed to also have been made in 1659. Huygens soon seemed to regret this invention, as he thought it was too frivolous. In a 1662 letter to his brother Lodewijk he claimed he thought of it as some old "bagatelle" and seemed convinced that it would harm the family's reputation if people found out the lantern came from him. Christiaan had reluctantly sent a lantern to their father, but when he realized that Constantijn intended to show the lantern to the court of King Louis XIV of France at the Louvre, Christiaan asked Lodewijk to sabotage the lantern. Huygens' 1694 laterna magica sketch, showing: "speculum cavum (hollow mirror). lucerna (lamp). lens vitrea (glass lens). pictura pellucida (transparent picture). lens altera (other lens). paries (wall)." Christiaan initially referred to the magic lantern as "la lampe" and "la lanterne", but in the last years of his life he used the then common term "laterna magica" in some notes. In 1694 he drew the principle of a "laterna magica" with two lenses. Thomas Rasmussen Walgensten (c. 1627 – 1681), a mathematician from Gotland, studied at the university of Leyden in 1657–58. He possibly met Christiaan Huygens during this time (and/or on several other occasions) and may have learned about the magic lantern from him. Correspondence between them is known from 1667. At least from 1664 until 1670 Walgensten was demonstrating the magic lantern in Paris (1664), Lyon (1665), Rome (1665-66) and Copenhagen (1670). He "sold such lanterns to different Italian princes in such an amount that they now are almost everyday items in Rome" according to Athanasius Kircher in 1671. In 1670 Walgensten projected an image of Death at the court of King Frederick III of Denmark. This scared some courtiers, but the king dismissed their cowardice and requested to repeat the figure three times. The king died a few days later. After Walgensten died, his widow sold his lanterns to the Danish Royal collection, but they have not been preserved. Walgensten is credited with coining the term "Laterna Magica", assuming he communicated this name to Claude Dechales who in 1674 published about the machine of the "erudite Dane" that he had seen in 1665 in Lyon. There are many gaps and uncertainties in the magic lantern's recorded history. A separate early magic lantern tradition seems to have been developed in southern Germany and includes lanterns with horizontal cylindrical bodies, while Walgensten's lantern and probably Huygens' both had vertical bodies. This tradition can be traced back to 1671 with the arrival of instrument maker Johann Franz Griendel in the city of Nürnberg, which Johann Zahn identified as one of the centers of magic lantern production in 1686. Griendel was indicated as the inventor of the magic lantern by Johann Christoph Kohlhans in a 1677 publication. It has been suggested that this tradition is older and that instrument maker Johann Wiesel (1583–1662) from Augsburg may have been making magic lanterns earlier on and possibly inspired Griendel and even Huygens. Huygens is known to have studied samples of Wiesel's lens-making and instruments since 1653. Wiesel did make a ship's lantern around 1640 that has much in common with the magic lantern design that Griendel would later apply: a horizontal cylindrical body with a rosette chimney on top, a concave mirror behind a fixture for a candle or lamp inside and a biconvex lens at the front. There is no evidence that Wiesel actually ever made a magic lantern, but in 1674 his successor offered a variety of magic lanterns from the same workshop. This successor is thought to have only continued producing Wiesel's designs after his death in 1662, without adding anything new. Before 1671 only a small circle of people seemed to have knowledge of the magic lantern, and almost every known report of the device from this period had to do with people that were more or less directly connected to Christiaan Huygens. Despite the rejection expressed in his letters to his brother, Huygens must have familiarized several people with the lantern. In 1664 Parisian engineer Pierre Petit wrote to Huygens to ask for some specifications of the lantern, because he was trying to construct one after seeing the lantern of "the dane" (probably Walgensten). The lantern that Petit was constructing had a concave mirror behind the lamp. This directed more light through the lens, resulting in a brighter projection, and it would become a standard part of most of the lanterns that were made later. Petit may have copied it from Walgensten, but he expressed that he made a lamp stronger than any he had ever seen. Since 1661 Huygens corresponded with London optical instrument-maker Richard Reeve. Reeve was soon selling magic lanterns, demonstrated one in his shop on 17 May 1663 to Balthasar de Monconys and sold one to Samuel Pepys in August 1666. One of Christiaan Huygens' contacts imagined how Athanasius Kircher would use the magic lantern: "If he would know about the invention of the Lantern he would surely frighten the cardinals with specters." Kircher would eventually learn about the existence of the magic lantern via Thomas Walgensten and introduced it as "Lucerna Magica" in the widespread 1671 second edition of his book Ars Magna Lucis et Umbrae. Kircher claimed that Thomas Walgensten reworked his ideas from the previous edition of this book into a better lantern. Kircher described this improved lantern, but it was illustrated in a confusing manner: the pictures seem technically incorrect with both the projected image and the transparencies (H) shown upright (while the text states that they should be drawn in an inverted position), the hollow mirror is too high in one picture and absent in the other, and the lens (I) seems to be placed at the wrong side of the slide. However, experiments with a construction as illustrated in Kircher's book proved that it could work as a point light-source projection system. The projected image in one of the illustrations shows a person in purgatory or hellfire and the other depicts Death with a scythe and an hourglass. According to legend Kircher secretly used the lantern at night to project the image of Death on windows of apostates to scare them back into church. Kircher did suggest in his book that an audience would be more astonished by the sudden appearance of images if the lantern would be hidden in a separate room, so the audience would be ignorant of the cause of their appearance. The earliest reports and illustrations of lantern projections suggest that they were all intended to scare the audience. Pierre Petit called the apparatus "lanterne de peur" (lantern of fear) in his 1664 letter to Huygens. Surviving lantern plates and descriptions from the next decades prove that the new medium was not just used for horror shows, but that all kinds of subjects were projected. In 1675 Wilhelm Leibniz saw an important role for the magic lantern in a plan for a kind of world exhibition with projections of "attempts at flight, artistic meteors, optical effects, representations of the sky with the star and comets, and a model of the earth (...), fireworks, water fountains, and ships in rare forms; then mandrakes and other rare plants and exotic animals." In 1685/6 Johannes Zahn was an early advocate for use of the device for educational purposes: detailed anatomical illustrations were difficult to draw on a chalkboard, but could easily be copied onto glass or mica. By the 1730s the use of magic lanterns started to become more widespread when travelling showmen, conjurers and storytellers added them to their repertoire. The travelling lanternists were often called Savoyards (they supposedly came from the Savoy region in France) and became a common sight in many European cities. In France in the 1770s François Dominique Séraphin used magic lanterns to perform his "Ombres Chinoises" (Chinese shadows), a form of shadow play. Magic lanterns had also become a staple of science lecturing and museum events since Scottish lecturer Henry Moyes’s tour of America in 1785–86, when he recommended that all college laboratories procure one. French writer and educator Stéphanie Félicité, comtesse de Genlis popularized the use of magic lanterns as an educational tool in the late 1700s when using projected images of plants to teach botany. Her educational methods were published in America in English translation during the early 1820s. A type of lantern was constructed by Moses Holden between 1814 and 1815 for illustrating his astronomical lectures. In 1821 Philip Carpenter's London company, that would become Carpenter and Westley after his death, started manufacturing a sturdy but lightweight and transportable "Phantasmagoria lantern" with an Argand style lamp, which produced high quality projections and was suitable for use in classrooms. Carpenter also developed a "secret" copper plate printing/burning process to mass-produce glass lantern slides with printed outlines, which were then easily and quickly hand painted ready for sale. These "copper-plate sliders" contained three or four very detailed 4" circular images mounted in thin hardwood frames. The first known set The Elements of Zoology became available in 1823, showing over 200 images in 56 frames of zoological figures, classified according to the system of the Swedish scientist Carl Linnaeus. The same year many other slides appeared in the company's catalogue: "The Kings and Queens of England" (9 sliders taken from David Hume’s History of England), "Astronomical Diagrams and Constellations" (9 sliders taken from Friedrich Wilhelm Herschel’s textbooks), "Views and Buildings", Ancient and Modern Costume (62 sliders from various sources). Fifteen sliders of the category "Humorous" provided some entertainment, but the focus on education was obvious and very successful. The mass production of slides also meant that the magic lantern now became affordable to the common men, opening a market for smaller lanterns with smaller glass sliders which instead of wooden frames usually had colorful strips of paper glued around their edges. Although the popularity of magic lanterns waned after the introduction of movies in the 1890s, they remained a common medium until slide projectors came into widespread use during the 1950s. Mice jump into the mouth of a sleeping bearded man on a popular mechanical slide from circa 1870. The magic lantern was not only a direct ancestor of the motion picture projector as a means for visual storytelling, but it could itself be used to project moving images. Some suggestion of movement could be achieved by alternating between pictures of different phases of a motion, but most magic lantern "animations" used two glass slides projected together - one with the stationary part of the picture and the other with the part that could be set in motion by hand or by a simple mechanism. Motion in animated slides was mostly limited to either two phases of a movement or transformation, or a more gradual singular movement (e.g. a train passing through a landscape). These limitations made subjects with repetitive movements popular, like the sails on a windmill turning around or children on a seesaw. Movements could be repeated over and over and could be performed at different speeds. A common technique that is comparable to the effect of a panning camera makes use of a long slide that is simply pulled slowly through the lantern and usually shows a landscape, sometimes with several phases of a story within the continuous backdrop. Movement of projected images was also possible by moving the magic lantern itself. This became a staple technique in phantasmagoria shows in the late 18th century, often with the lantern sliding on rails or riding on small wheels and hidden from the view of the audience behind the projection screen. In 1645 Kircher had already suggested projecting live insects and shadow puppets from the surface of the mirror in his Steganographic system to perform dramatic scenes. Christiaan Huygens' 1659 sketches (see above) suggest he intended to animate the skeleton to have it take off its head and place it back on its neck. This can be seen as an indication that the very first magic lantern demonstrations may already have included projections of simple animations. 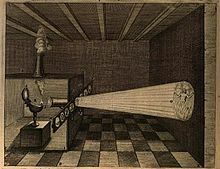 In 1668 Robert Hooke wrote about the effects of a type of magic lantern installation: "Spectators not well versed in optics, that should see the various apparitions and disappearances, the motions, changes and actions that may this way be represented, would readily believe them to be supernatural and miraculous." In 1675 German polymath and philosopher Gottfried Wilhelm Leibniz proposed a kind of world exhibition that would show all kinds of new inventions and spectacles. In a handwritten document he supposed it should open and close with magic lantern shows, including subjects "which can be dismembered, to represent quite extraordinary and grotesque movements, which men would not be capable of making" (translated from French). Several reports of early magic lantern screenings possibly described moving pictures, but are not clear enough to conclude whether the viewers saw animated slides or motion depicted in still images. In 1698 German engraver and publisher Johann Christoph Weigel described several lantern slides with mechanisms that made glass parts move over one fixed glass slide, for instance by the means of a silk thread, or grooves in which the mobile part slides. By 1709 a German optician and glass grinder named Themme (or Temme) made moving lantern slides, including a carriage with rotating wheels, a cupid with a spinning wheel, a shooting gun and falling bombs. Wheels were cut from the glass plate with a diamond and rotated by a thread that was spun around small brass wheels attached to the glass wheels. A paper slip mask would be quickly pulled away to reveal the red fiery discharge and the bullet from a shooting gun. Zacharias Conrad von Uffenbach visited Themme's shop and liked the effects, but was disappointed about the very simple mechanisms. Nonetheless he bought seven moving slides, as well as twelve slides with four pictures each, which he thought were delicately painted. Several types of mechanical slides were described and illustrated in Dutch professor of mathematics, physics, philosophy, medicine, and astronomy Pieter van Musschenbroek's second edition (1739) of Beginsels Der Natuurkunde. Pieter was the brother of Jan van Musschenbroek, the maker of an outstanding magic lantern with excellent lenses and a diaphragm (see illustration above). In 1770 Edmé-Gilles Guyot described a method of using two slides for the depiction of a storm at sea, with waves on one slide and ships and a few clouds on another. Lanternists could project the illusion of mild waves turning into a wild sea tossing the ships around by increasing the movement of the separate slides. Guyot also detailed how projection on smoke could be used to create the illusion of ghosts hovering in the air, which would become a technique commonly used in phantasmagoria. An especially intricate multiple rackwork mechanism was developed to show the movements of the planets (sometimes accompanied by revolving satellites) revolving around the sun. In 1795 one M. Dicas seems to have offered an early magic lantern system, the Lucernal or Portable Eidouranian, that showed the orbiting planets. From around the 1820s mechanical astronomical slides became quite common. slipping slides: a movable glass plate with one or more figures (or any part of a picture for which movement was desired) was slipped over a stationary one, directly by hand or with a small drawbar (see: Fig. 7 on the illustration by Petrus van Musschenbroek: a tightrope walker sliding across the rope). A common example showed a creature that could move the pupils in its eyes, as if it was looking in all directions. A long piece of glass could show a procession of figures, or a train with several wagons. Quite convincing illusions of moving waves on a seas or lake have also been achieved with this method. slipping slides with masking: black paint on portions of the moving plate would mask parts of the underlying image - with a black background - on the stationary glass. This made it possible to hide and then reveal the previous position of a part, for instance a limb, to suggest repetitious movement. The suggested movement would be rather jerky and usually operated quickly. Masking in slides was also often used to create change rather than movement (see: Fig. 6 on the illustration by Petrus van Musschenbroek: a man, his wig and his hat): for instance a person's head could be replaced with that of an animal. More gradual and natural movement was also possible; for instance to make a nose grow very long by slowly moving a masking glass. rack and pinion slides: turning the handle of a rackwork would rotate or lift the moving part and could for instance be used to turn the sails on a windmill or for having a hot air balloon take off and descend. A more complex astronomical rackwork slide showed the planets and their satellites orbiting around the sun. fantoccini slides: jointed figures set in motion by levers, thin rods, or cams and worm wheels. A popular version had a somersaulting monkey with arms attached to mechanism that made it tumble with dangling feet. Named after the Italian word for animated puppets, like marionettes or jumping jacks. Two different British patents for slides with moving jointed figures were granted in 1891.
a snow effect slide can add snow to another slide (preferably of a winter scene) by moving a flexible loop of material pierced with tiny holes in front of one of the lenses of a double or triple lantern. the Chromatrope: a slide that produces dazzling colorful geometrical patterns by rotating two painted glass discs in opposite directions, originally with a double pulley mechanism but later usually with a rackwork mechanism. It was possibly invented around 1844 by English glass painter and showman Henry Langdon Childe and soon added as a novelty to the program of the Royal Polytechnic Institution. the Astrometeoroscope or Astrometroscope: a large slide that projected a lacework of dots forming constantly changing geometrical line patterns, compared with stars and meteors. It was invented in or before 1858 by the Hungarian engineer S. Pilcher and used a very ingenious mechanism with two metal plates obliquely crossed with slits that moved to and fro in contrary directions. Except for when the only known example was used in a performance, it was kept locked away at the Polytechnic so no one could discover the secret technique. When the Polytechnic auctioned the device, Picher eventuaslly paid an extravagant price for his own invention in order to keep is workings secret. the Eidotrope: counter-rotating discs of perforated metal or card (or wire gauze or lace), producing swirling Moiré patterns of bright white dots. It was invented by English scientist Charles Wheatstone in 1866.
the Kaleidotrope: a slide with a single perforated metal or cardboard disc suspended on a spiral spring. The holes can be tinted with colored pieces of gelatin. When struck the disc's vibration and rotation sends the colored dots of light swirling around in all sorts of shapes and patterns. The device was demonstrated at the Royal Polytechnic Institution around 1870 and dubbed "Kaleidotrope" when commercial versions were marketed. the Cycloidotrope (circa 1865): a slide which had an adjustable stylus bar drawing geometric patterns on sooty glass when hand cranked during projection. The patterns are similar to that produced with a Spirograph. The effect of a gradual transition from one image to another, known as a dissolve in modern filmmaking, became the basis of a popular type of magic lantern show in England in the 19th century. Typical dissolving views showed landscapes dissolving from day to night or from summer to winter. This was achieved by aligning the projection of two matching images and slowly diminishing the first image while introducing the second image. The subject and the effect of magic lantern dissolving views is similar to the popular Diorama theatre paintings which originated in Paris in 1822. The terms "dissolving views", "dioramic views", or simply "diorama" were often used interchangeably in 19th century magic lantern broadsides. Another possible inventor is Henry Langdon Childe, who purportedly once worked for De Philipsthal. He is said to have invented the dissolving views in 1807 and to have improved and completed the technique in 1818. The oldest known use of the term "dissolving views" occurs on playbills for Childe's shows at the Adelphi Theatre in London in 1837. Childe further popularized the dissolving views at the Royal Polytechnic Institution in the early 1840s. Despite the later reports about the early invention and apart from De Philipsthal's 1812 performance, no reports of dissolving view shows before the 1820s are known and in some cases confusion with the Diorama or similar media is possible. In 1826 Scottish magician and ventriloquist M. Henry's introduced what he referred to as "Beautiful Dissolvent Scenes", "imperceptibly changing views", "dissolvent views" and "Magic Views" which were created "by Machinery invented by M. Henry". In 1827 Henry Langdon Childe presented "Scenic Views, showing the various effects of light and shade" with a series of subjects that would become classics for the dissolving views. In December 1827 De Philipsthal returned with a show that included "various splendid views (...) transforming themselves imperceptibly (as if it were by Magic) from one form into another". Biunial lanterns, with two projecting optical sets in one apparatus, were produced to more easily project dissolving views. Possibly the first horizontal biunial lantern, dubbed the "Biscenascope" was made by the optician Mr. Clarke and presented at the Royal Adelaide Gallery in London on December 5, 1840. The earliest known illustration of a vertical biunial lantern, probably provided by E.G. Wood, appeared in Horne & Thornthwaite catalogue in 1857. Later on triple lanterns enabled additional effects, for instance the effect of snow falling while a green landscape dissolves into a snowy winter version. A mechanical device could be fitted on the magic lantern, which locked up a diaphragm on the first slide slowly whilst a diaphragm on a second slide was opened simultaneously. Philip Carpenter's copper-plate printing process, introduced in 1823, may have made it much easier to create duplicate slides with printed outlines that could then be colored differently to create dissolving view slides. However, all early dissolving view slides seem to have been hand-painted. galvanometer slide: a flattened coil with a magnetized needle moving from side to side when a battery is connected. projection of moving frog legs, with the nerves and muscles of severed frog legs connected to electric wires. hour-glass projection: the projection of a flattened hourglass showed the sand flowing upwards. Extreme magnification made the effect extra impressive, with the grains of sand forming a wave-like pattern. cohesion figure projection of liquids: different oils and fats create all kinds of moving patterns when manipulated between clear glass plates or a narrow glass box. Several of these experiments were publicly demonstrated at the Royal Polytechnic Institution Institution. Versions of the magic lantern were used to project transparent variations of the phénakisticope. These were adapted with a mechanism that spins the disc and a shutter system. Duboscq produced some in the 1850s and Thomas Ross patented a version called "Wheel of life" in 1869 and 1870. The Choreutoscope was invented around 1866 by the Greenwich engineer J. Beale and demonstrated at the Royal Polytechnic. It projected six pictures from a long slide and used a hand-cranked mechanism for intermittent movement of the slide and synchronized shutter action. The mechanism became a key to the development of the movie camera and projector. The Choreutoscope was used at the first professional public demonstration of the Kinetoscope to explain its principles. An "Optical Instrument" was patented in the U.S. in 1869 by O.B. Brown, using a phenakistiscope-like disc with a technique very close to the later cinematograph; with Maltese Cross motion; a star-wheel and pin being used for intermittent motion, and a two-sector shutter. John Arthur Roebuck Rudge built a lantern for William Friese-Greene with a mechanism to project a sequence of seven photographic slides. It was reportedly made in 1872, but also 1875 and a more likely date of 1882 have been given. The surviving slides show a man removing his head with his hands and raising the loose head. The photographed body belonged to Rudge and Friese-Greene posed for the head. The slides probably provided the very first trick photography sequence projection. Friese-Greene's demonstrated the machine in his shop, until the police ordered him to remove it when it attracted too large a crowd. Phantasmagoria was a form of horror theater that used one or more magic lanterns to project frightening images, especially of ghosts. Showmen used rear projection, mobile or portable projectors and all kinds of effects to produce convincing necromantic experiences. It was very popular in Europe from the late 18th century to well into the 19th century. It is thought that optical devices like concave mirrors and the camera obscura have been used since antiquity to fool spectators into believing they saw real gods and spirits, but it was the magician "physicist" Phylidor who created what must have been the first true phantasmagoria show. He probably used mobile magic lanterns with the recently invented Argand lamp to create his successful Schröpferischen, und Cagliostoischen Geister-Erscheinungen (Schröpfer-esque and Cagiostro-esque Ghost Apparitions) in Vienna from 1790 to 1792. Phylidor stated that his show of perfected apparitions revealed how charlatans like Johann Georg Schröpfer and Cagliostro had fooled their audiences. As "Paul Filidort" he presented his Phantasmagorie in Paris From December 1792 to July 1793, probably using the term for the first time. As "Paul de Philipsthal" he performed Phantasmagoria shows in Britain since 1801 with great success. One of many showmen who were inspired by Phylidor, Etienne-Gaspard Robert became very famous with his own Fantasmagorie show in Paris from 1798 to 1803 (later performing throughout Europe and returning to Paris for a triumphant comeback in Paris in 1814). He patented a mobile "Fantascope" lantern in 1798. Since its opening in 1838 The Royal Polytechnic Institution in London became a very popular and influential venue with all kinds of magic lantern shows as an important part of its program. At the main theatre, with 500 seats, lanternists would make good use of a battery of six large lanterns running on tracked tables to project the finely detailed images of extra large slides on the 648 square feet screen. The magic lantern was used to illustrate lectures, concerts, pantomimes and other forms of theatre. Popular magic lantern presentations included Henry Langon Childe's dissolving views, his chromatrope, phantasmagoria and mechanical slides. Utushi-e is a type of magic lantern show that became popular in Japan in the 19th century. The Dutch probably introduced the magic lantern in Japan before the 1760s. A new style for magic lantern shows was introduced by Kameya Toraku I, who first performed in 1803 in Edo. Possibly the phantasmagoria shows (popular in the west at that moment) inspired the rear projection technique, moving images and ghost stories. Japanese showmen developed lightweight wooden projectors (furo) that were handheld so that several performers could move the projections of different colourful figures move around the screen at the same time. The Western techniques of mechanical slides were combined with traditional Japanese skills—especially from Karakuri puppets—to further animate the figures and for special effects. Some enthusiasts claim that the brilliant quality of color in lantern slides is unsurpassed by successive projection media. The magic lantern and lantern slides are still popular with collectors and can be found in many museums. However, of the original lanterns from the first 150 years after its invention only 28 are known to still exist (as of 2009). Museums usually prefer not to use their slides for projections, but often provide video representations of the slides. A collaborative research project of several European universities called A Million Pictures started in June 2015 and will last until May 2018. It addresses the sustainable preservation of the massive, untapped heritage resource of the tens of thousands of lantern slides in the collections of libraries and museums across Europe. Genuine public lantern shows are relatively rare; several regular performers state to be the only one of their kind in their part of the world. These include Pierre Albanese and glass harmonica player Thomas Bloch live Magic Lantern/Phantasmagoria shows since 2008 in Europe and The American Magic-Lantern Theater. The Magic Lantern Society maintains a list of active lanternists, which contains more than 20 performers in the U.K. and circa eight performers in other parts of the world (Europe, U.S., Canada, Australia and New Zealand). Dutch theatre group Lichtbende produces contemporary magical light spectacles and workshops with magic lanterns. ^ Pfragner, Julius. "An Optician Looks for Work". The Motion Picture: From Magic Lantern to Sound. Great Britain: Bailey Brothers and Swinfen Ltd. 9-21. Print. ^ "All about lantern slides (1)". ^ "All about magic lantern slides (2)". ^ U.S. Patent US7784 A: Improvement in photographic pictures on glass. ^ Timby, Kim (2016). Glass Transparencies: Marketing Photography’s Luminosity and Precision. ^ "Historic Camera: William and Frederick Langenheim". ^ Waddington, Damer. "Introduction". Panoramas, Magic Lanterns and Cinemas. Channel Islands, NJ: Tocan Books. xiii-xv. Print. ^ a b c d e f Rossell, Deac (2002). "The Magic Lantern". ^ Snyder, Laura J. (2015). "Eye of the Beholder". ^ Kircher, Athanasius (1645). Ars Magna Lucis et Umbrae. p. 912. ^ "De zeventiende eeuw. Jaargang 10" (in Dutch and Latin). ^ Rossell, Deac (2008). Laterna Magica - Magic Lantern: Vol. 1. Füsslin Verlag. p. 19. ^ Huygens, Christiaan (1629-1695) Auteur du texte. "Oeuvres complètes de Christiaan Huygens. Supplémént à la correspondance varia. Biographie de Chr. Huygens. Catalogue de la vente des livres de Chr. Huygens / publ. par la Société hollandaise des sciences". M. Nijhoff – via gallica.bnf.fr. ^ Huygens, Christiaan. "Pour des representations par le moyen de verres convexes à la lampe" (in French). ^ Huygens, Christiaan (19 April 1662). "letter to Lodewijk Huygens" (in French). ^ Huygens, Christiaan (1694). "Aanhangsel II bij het eerste Complement van de Dioptrica" (in Dutch). ^ "An Introduction to Lantern History: The Magic Lantern Society". magiclantern.org.uk. Retrieved 28 August 2017. ^ Dechales. Cursus seu mundus mathematicus - Tomus primus (in Latin). ^ Dechales (1674). Cursus seu mundus mathematicus - Tomus secundus (in Latin). ^ Rossell, Deac (2004). The Origins of the Magic Lantern in Germany. ^ a b Petit, Pierre (28 November 1664). "letter to Christiaan Huygens". ^ "Journal des voyages de Monsieur de Monconys » Picturegoing". picturegoing.com. Retrieved 28 August 2017. ^ "Sunday 19 August 1666 (The Diary of Samuel Pepys)". pepysdiary.com. Retrieved 28 August 2017. ^ "Wednesday 22 August 1666 (The Diary of Samuel Pepys)". pepysdiary.com. Retrieved 28 August 2017. ^ letter from Pierre Guisony to Christiaan Huygens (in French). 25 March 1660. ^ Kircher, Athanasius (1671). Ars Magna Lucis et Umbrae (in Latin). pp. 767=769. Retrieved 19 August 2010. ^ a b Kircher, Athanasius; Rendel, Mats. "About the Construction of The Magic Lantern, or The Sorcerers Lamp". ^ "The mystery of the wrongly placed lenses (luikerwaal.com)". ^ "The miracle of the magic lantern". ^ "MIT Press Journals". mitpressjournals.org. Retrieved 28 August 2017. ^ "Holden, Moses (DNB00) - Wikisource, the free online library". en.m.wikisource.org. Retrieved 17 September 2015. ^ Philip Carpenter, 1823, A Companion to the Magic Lantern: Part II. ^ Gorman, Michael John (2007). Inside the Camera Obscura (PDF). p. 44. ^ a b c d Rossell, Deac (2005). The Magic Lantern and Moving Images before 1800. ^ "The Philosophical Transactions of the Royal Society of London, from Their Commencement in 1665 to the Year 1800". 22 May 2018 – via Google Books. ^ Rossell, Deac (2002). Leibniz and the Lantern. ^ Gottfried Wilhelm Leibniz (1675). Drôle de Pensée, touchant une nouvelle sorte de représentations. Retrieved 26 January 2017. ^ Mannoni; Campagnoni; Robinson (1995). Light and Movement. ^ Von Uffenbach (1753). Merkwürdige Reisen durch Niedersachsen, Holland und Engelland - Erster Theil (in German). pp. 62–63. ^ Van Musschenbroek, Pieter (1739). Beginsels Der Natuurkunde. p. 617+633. ^ a b c d e "Luikerwaal - Mechanical Slides". ^ "Magic lantern - collection of moving magic lantern slides part 1". Luikerwaal. ^ "Luikerwaal - Fantoccini Slides". ^ a b c "Luikerwaal - Mechanical special effects slides". ^ "de Luikerwaal - Chromatropes". ^ "the saleroom.com - lot 266". ^ "dickbalzer.com - Polytechnic size". ^ The Athenæum. 21 December 1844. ^ The Royal Polytechnic Institution - Catalogue for 1845. ^ Hepworth, Thomas Cradock (22 May 1888). "The book of lantern ; being a practical guide to the working of the optical (or magic) lantern ; with full and precise directions for making and colouring lantern pictures". London : Wyman & Sons – via Internet Archive. ^ "Popular Educator a Complete Encyclopaedia of Elementary, Advanced, and Technical Education". Cassell. 22 May 2018 – via Google Books. ^ Timbs, John (1867). The Year-book of Facts in Science and Art. ^ Wheatstone, Charles (1850–1875). Extracts from the papers of Sir Charles Wheatstone (PDF). ^ The Magic Lantern - Vol. 1. No. 2. October 1874. ^ a b c d Huhtamo, Erkki. "Ghost Notes: Reading Mervyn Heard's Phantasmagoria. The Secret Life of the Magic Lantern" (PDF). The Magic Lantern Gazette. 18 (4). ^ a b c The Mirror of Literature, Amusement, And Instruction. 1842. p. 98. ^ The Art-journal, New Series, Volume XIII. 1874. ^ Hepworth, T.C. (1888). The book of the lantern. pp. 171–203. ^ Herbert, Stephen. "Projection Phenakistoscope 1". www.stephenherbert.co.uk. Retrieved 19 July 2016. ^ Rossell, Deac (1998). Living Pictures: The Origins of the Movies. ^ U.S. Patent No. 93,594. 10 August 1869. ^ "Lanterne de projection (AP-94-33) - Collection - Catalogue des appareils cinématographiques - La Cinémathèque française". cinematheque.fr. Retrieved 28 August 2017. ^ Rossell, Deac (2001). The_19_Century_German_Origins_of_the_Phantasmagoria_Show. ^ The Magazine of Science, and Schools of Art - Vol. IV. 1843. p. 410. ^ "A Million Pictures (website)". ^ Thomas Bloch. "THOMAS BLOCH ** ONDES MARTENOT - GLASSHARMONICA - CRISTAL BASCHET --- performances, ensembles..." thomasbloch.net. Retrieved 28 August 2017. ^ "American Magic-Lantern Theater -". magiclanternshows.com. Retrieved 28 August 2017. ^ "Active Lanternists: The Magic Lantern Society". ^ "Lichtbende - Magic Lantern". Look up magic lantern in Wiktionary, the free dictionary. Wikimedia Commons has media related to Magic lanterns. Lantern Slide Collection at Cleveland Public Library's Digital Gallery. The lantern slides are part of the library's W. Ward Marsh Collection.